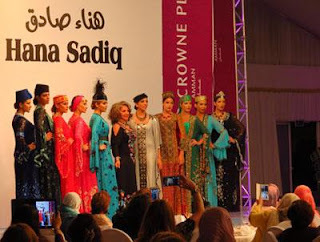 AMMAN — Brightly coloured clothes, beautifully laid tables and a runway cutting across the room — Amman’s glitterati showed up to view the premier of Hana Sadiq’s new fall collection at the Crowne Plaza Hotel in Amman on Saturday night. Using a mix of colours and fabrics, Jordanian designer Sadiq told The Jordan Times that her show, titled “Between Bedouin and Civilisation”, aimed to merge the beauty of the bedouin aesthetic with modernity. “I think that in the Arab countries there is a lot of beauty and art, but nobody really concentrates on how to merge it in a modern way through fashion,” she said, adding that “you see old women wearing the traditional dresses, or people in jeans. In between, there is nothing, this is the gap I am trying to fill”. Sadiq’s clothing is “luxury, high quality art” that merges the modern with the traditional. The designer said she uses patchwork in her clothing “because it is very bedouin”, while her incorporation of mirrors, “because they reflect the bad spirits and vibration”, is maintaining her strong ties to Arabic culture and history. Sadiq also incorporates Arabic poetry into the flowing cloaks and dresses she designs. The event attracted ambassadors, ministers and artists, as well as the designer’s clients. Sadiq was pleased with the turnout. Sadiq’s new collection differs from her previous summer collection because it includes more casual items, easy to wear during the day as well as at night, while remaining chic. The designer noted that this show was different, not only because of its theme of modernising bedouin beauty, but also in the sheer variety and modernity of the pieces themselves.